Stem of the poppy plant showing foliage, bud (also shown in cross section), and flower. Opium poppy, Papaver somniferum, is the species of plant from which opium and poppy seeds are derived. 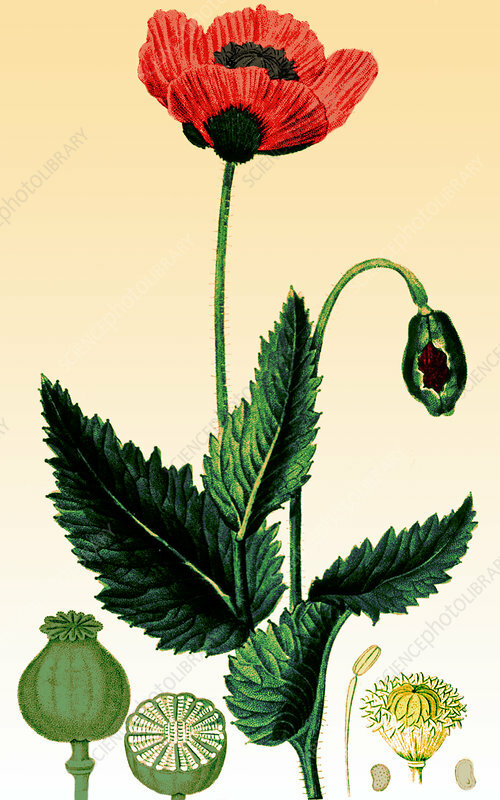 Opium was used for treating asthma, stomach illnesses, and bad eyesight. Opium is the source of many narcotics, including morphine (and its derivative heroin), thebaine, codeine, papaverine, and noscapine. The Latin botanical name means the sleep-bringing poppy , referring to the sedative properties of some of these opiates. The opium resin from the poppy is processed, and then burned in pipes. The smoker inhales the vapours from the burning resin. Opium is an addictive drug. In the 19th century and the early 20th century, opium smoking was common worldwide, especially in Asia, which was one of the sources of the opium poppy.